A United Nations special envoy has said he plans to go ahead with a visit to Burma later this week, and hopes to see detained opposition leader Aung San Suu Kyi. 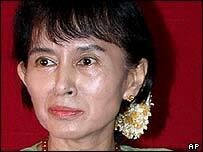 Razali Ismail told the BBC he had always been given access to Aung San Suu Kyi when she was under house arrest, and saw no reason why this should have changed. He says he will be telling the generals in no uncertain terms that they have no justification for holding Aung San Suu Kyi in protective custody and should release her immediately. The envoy helped broker peace talks between the two sides more than two years ago. The military junta took the opposition leader into "protective custody" last week following clashes between her followers and government supporters. Aung San Suu Kyi was freed from house arrest last May and has attracted large crowds during visits to her supporters around the country. Her location is unknown, and the military says it cannot guarantee Mr Razali access to her during his four-day visit, due to start on Friday. Other diplomats and UN officials have been repeatedly denied access to her. Mr Razali also called on the international community, including the Association of Southeast Asian Nations (Asean), to take a tougher stand against Burma's military junta. "It really undermines the credibility of Asean by insisting on non-interference and in the process of doing that perpetuating the status quo when clearly the people of Myanmar want change," he told the BBC's World Today programme, using an alternate name for the country. Eyewitnesses say Aung San Suu Kyi received cuts to her face and shoulder during the clashes on Friday in the north of the country, but her injuries are not thought to be serious. The military government said four people were killed in last week's clashes, but eyewitnesses estimated that more than 60 people died in the incident. The BBC's Burma analyst, Larry Jagan, says diplomats in the capital now fear for the safety of these sources, as the government tries to cover up the incident. The military regime has also put other opposition leaders under house arrest and shut National League for Democracy offices around the country. 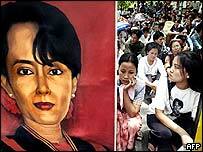 The NLD won 1990 elections by a landslide but the junta refused to give up power. Access to BBC News Online was blocked inside Burma on Wednesday.